Hands and Minds and Sneaking through the Cracks–this may be an effective way to use the schools for transformation, but it’s an invisible to most one. When Surman wrote about “young people have the skills and mindsets they need to thrive in today’s world,” his writing could be taken from the English language and 2015 and the American continent and taken back to the 30s and Eurasia and translated into Russian. Stalin too was anxious to turn his young people into purposeful change agents ready to act on and to bring change to their surroundings. To shift the emphasis from the world as it had been and what currently existed to what might be with enough collaborative effort and the right set of guiding ideas. So what happens now when district administrators, statutes, and politicians at every level of both parties abbreviate that push as the “full development of the individual’s capabilities and personality” as the goal? Is that possible in a society where individuals still are empowered vs political institutions hyping Equity and necessary ‘governance’? What if those goals are set out in a Beta Credentials Framework created by Mozilla frequent Partner–the Lumina Foundation–http://connectingcredentials.org/wp-content/uploads/2015/05/ConnectingCredentials-4-29-30.pdf that is intended to bind while remaining unseen. What if that Framework discloses not just desired ways of Thinking and Personal and Social Skills, but that in the US and internationally there is a Tuning Process to standardize and circumscribe knowledge in each of the disciplines. Also notice the admission of what I warned about in Chapter 4 of my book-the US is adopting Qualifications Frameworks that will bind employers into hiring quotas. There is a recurring theme through the Playbook, the Agency by Design “Maker-Centered Learning and the Determination of Self” mentioned in the last post, and that Lumina Credentials Framework. Young people are to be trained, primed, and credentialed to act with no body of knowledge available to be a barrier to a willingness to act. When the purpose of all education becomes about how can “students come to see themselves as capable of effecting positive change in their own lives and in the community” and “muster the wherewithal to change things through making,” we are back in the aspirations Nobel-Prize economist Friedrich Hayek called The Fatal Conceit: The Errors of Socialism in his last book. When the declared aspirations are to turn these fostered dispositions and beliefs into “habits of mind” guiding from an unconscious level, we cannot afford to be waved off from a discussion of the likely consequences because we may not have ed degrees and those with them think this is all A-OK. After all, I have listened to Ed Doctorate admins brag about using notorious brainwashing techniques on reluctant teachers without any idea there is any notoriety attached to what they are suggesting. We parents, in other words, and just average concerned citizens who know what made this country great and what has always doomed civilizations in the past have to be the Cavalry. Even the rare politician with an excellent mind seems to get bad advice from their staff or the ‘conservative’ think tanks on the issue of education and that’s apart from not bothering to read the binding language they are willing to enact or appreciating the presence of a Scheffler Programmatic Novel Definition. This parent read all the references to designing and making new ways of being in the world and remembered something Harvard psychologist Jerome Bruner wrote in 1951 in the Foreword of the other Russian Research Center book we have covered. Now we have this exact aspiration of molding going on, but hiding behind terms like Whole Child, learning needs, student-centered or personalized learning, Maker Movement and others that obscure the nature and purpose of the true K-12 and higher ed shift. I can at least track all these shifts and recognize the fallacies involved and go looking for someone far more authoritative and experienced with the tragedies of these idea to cite. What did Hayek mean as the Fatal Conceit? He described it as the socialist or Planning belief that “man is able to shape the world around him according to his wishes.” Sound familiar from even a typical city council meeting these days or a faculty luncheon? 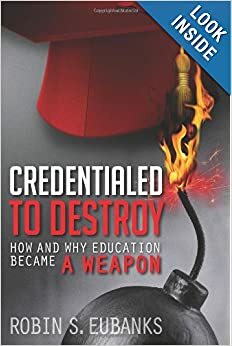 I cover this somewhat in my book Credentialed to Destroy: How and Why Education Became a Weapon, but with the Maker Movement and Agency by Design and engineered Competencies and Habits of Mind bringing all these aspirations once again to the forefront, let’s go back in history to recognize the likely consequences. Historically, economic prosperity arose in “those communities [where] individuals were allowed to make free use of their individual knowledge.” Now in the name of Equity we are limiting and prescribing what is to be known. That would be the Antithesis of what works and is entirely consistent with the norm noted by Hayek where “common local knowledge or that of a ruler determined the activities of all.” Make that rulers plural now between the mayors, legislators, governors, Congress, and the OECD and UN entities. That is precisely what is being attempted in the US and elsewhere all over the West in 2015 and education is the most formidable arrow in the Planning and Future Alteration Quiver. I do not bring back expressions like the New Soviet Man to hype, but as a reminder that the techniques are the same and so are the goals. The West, and especially the US, is supposedly the place with the technology and wealth to meet everyone’s needs globally. What Uncle Karl called little c communism and the Soviets never thought they were ready for. The global entities and too many foundations and grievance interest groups think now is the time and we are the place to push for this peaceful shift via education, the ballot box, federal spending, and raw political power. It won’t work for the reasons Hayek cited, but we all have to be able to call a Spade a Spade and recognize what is being attempted, how, and why. Stopped by powerful governments, parasitic officials, and obtuse politicians is not the epitaph any of us want with an upcoming 239th Anniversary of the Greatest Country in History looming. Remember that catchy Peter Paul and Mary song “Leaving on a Jet Plane”? Well, I am practically humming it in my head this afternoon. After reading revelations in the last few months that have me feeling like I have been staring at a supernova without my comrade-approved conceptual goggles, I am taking a little break. Because things have been breaking so fast and furiously just in the last week though, I want to talk first about what is happening and also to bring back a group of posts that bears directly on interpreting the intentions of the Every Child Achieves Act of 2015. Now I am known for liking a good Grab the Attention metaphor in my titles, but this one is an actual quote of the intentions involving students, education, data, and experimenting to create new kinds of people and societies via public policy. First, we get a declaration of giving the public bogus reasons on why children need to learn to code as a basic new educational skill. Meanwhile admitting that the required practices will reorient students into the new ways of thinking “required to participate in the digital governance of the state” [and thus them, whether our ‘new thinkers’ ever grasp that real goal]. Later, ‘digital making’ activities are acknowledged as “a way of seeking to shape citizen subjectivities and capacities”, which certainly fits with my insistence that K-12 education globally is now intent on molding future likely behaviors and the student’s personality at a biological level. I will deal with NGSS when I return so wish me a safe trip. In the meantime we also have philanthropies and governments at all levels admitting their coordinated efforts with each other to redesign society around place-based initiatives. https://socialinnovation.usc.edu/files/2014/12/Prioritizing-Place-Moving-to-Higher-Ground.pdf Of course that report further confesses all the particular federal programs we are funding with all this deficit spending and the ties to fed Ed and then the need to transform the broader social and economic systems. We are told excitedly that this is not an ‘Either/Or” situation, but calls for an Integrated Framework that they intend to keep practicing on us with. Maybe I should find a cave somewhere and just hide in the wilderness. If I did that though, who else would look at a paper like https://drive.google.com/file/d/0B__OTXR_u3RbYkRQX3dKWjNtalE/view “Driving the skills agenda: Preparing students for the future” from Google [who is really psyched about this data emphasis by the way] and notice all the undisclosed connections. Instead of reading it as major employer speaks about what all employers need, I remembered our recent post http://www.invisibleserfscollar.com/windows-on-the-mind-to-confiscate-and-control-our-very-essence/ where Google called for changes in public policy to redesign society. Maybe Google is once again speaking as someone with a Stake in this Game of Experimentalism with Data and less as an Employer. I noticed Google hired the Economist Intelligence Unit to prepare the report, but no one ever mentioned that Pearson, with its global Ed Unit headed by Sir Michael Barber of ISC tag fame himself, owns The Economist. Many of the experts involved with the report are also involved with ATC21S, the global 21st century skills initiative backed by Microsoft, Cisco, and Intel, but that is omitted from the paper as well. Since I covered ATC21S in my book Credentialed to Destroy, I got to call on that knowledge in reading the report. It also allowed me to notice that the very skills “employers need” are the same skills being touted as necessary to be a 21st Century ATC21S Learner. Now since Pearson is officially part of ATC21S and so are UNESCO, the OECD, and the World Bank we are getting what will satisfy the desires of the transformative Learning Metrics Task Force now being pitched as necessary to satisfy what employers need. I can practically see every county, state, or country bidding to be the next recipient of a jobs-creating data center for Google being presented with that very document. Then the eager-to-please and plan ‘business development’ mayor, council members, governors, legislators, and Congress critters will cry in unison that “this is what our schools must do or there will be no jobs.” That’s how what is openly acknowledged to be Experimentalism and social theories looking for implementation to produce data to see if they work makes it all the way to your local school to start that Shaped and Sculpted Process. Beyond those links that should probably be read with an adult beverage or your blood pressure medicine nearby, I am providing the links to a series of posts I wrote originally in January 2014. I called it the Obuchenie Trilogy, but there were four of them as it turned out. Obuchenie is a Russian word that does not translate smoothly into English, but understanding it as a goal is crucial for translating the Every Child Achieves Act’s aspirations for our children into the actual goals. In order here are the posts so we can get ready to deal with ECAA when I get back. Reading the language of the new form of ECAA, 1177, made me think of what Benjamin Bloom really intended Mastery Learning to become because that seemed to be a driver behind the 1177 language’s clear intent to fundamentally change our children. When I went back to the early 70s, I found Bloom writing alarmingly about changing the nature of the task in order to change the student in order to get at Cognitive Behaviors and Affective Characteristics. Well, that’s clearly not just another way to teach math or reading so it becomes accessible to all. There was something else noticeable though in the 1974 book schools, society, and mastery learning that wrote up presentations from an AERA annual conference. Remember what the typeface created by the old typewriters looked like and how much trouble it would be to hyphenate ‘teaching-learning process’ just like that for more than 100 pages of typing. Sometimes it appears several times on a single page. Someone wanted that hyphenation because it helped stipulate the meaning of the phrase. In my mind, that much trouble consistently gone to in the early 70s means we are right about the phrase being a translated Russian word for a psychological and pedagogical practice created over there. Being brought over here and in 2015 it’s about to make it into a federal law when accurately understood. Don’t expect a thank you from me for THAT importation into our classrooms. Russian psych research, federal law, and Experimentalism via data as an ideological project of designing the future. Leaving everyone with lots of relevant reading so no one needs to Miss Me While I’m Gone. Now humming “Sure Gonna Miss Me While I’m Gone” as I pack. See ya.